Not all rebel leaders succeeded in escaping to the US after William Lyon Mackenzie's brief Upper Canada rebellion in 1837. The British captured Samuel Lount, Peter Matthews, and Anthony Van Egmond in flight. Each commanded rebel troops during the attack on Toronto, and each paid the ultimate price. Samuel Lount (September 24, 1791-April 12, 1838) was born in Catawissa, Pennsylvania. He came to Upper Canada in 1811 with his parents and settled in Whitchurch Township northeast of Toronto. He became a blacksmith and moved his family to Holland Landing, north of Toronto, in 1818. There he prospered and developed a reputation as a man to count on if you needed help. The Lounts were members of a pacifist Quaker sect called the Children of Peace. Peter Matthews (1786-April 12, 1838) was born in the Bay of Quinte area of Upper Canada and lived his adult life in Pickering east of Toronto. A son of United Empire Loyalists, he served as a militia sergeant during the War of 1812 and fought under General Isaac Brock. On December 6, 1837, he arrived at Montgomery's Tavern at the head of a group of rebels. The next day, Mackenzie sent him to create a diversion on the bridge over the Don River. His troop killed one man and set fire to the bridge and some nearby houses before being driven off by the militia. Lount's 1837 arrest notice—offering £500 for his capture—described him as a slow talker, six-feet-tall or more, with a long face, sallow complexion, very dark eyebrows, and black hair with some gray. The new lieutenant-governor of Upper Canada, Sir George Arthur, decided to make examples of the captured rebel leaders. He condemned Lount and Matthews to death. Lount's wife Elizabeth wrote letters pleading for mercy and once begged Sir George on her knees to spare her husband. Sir George ignored Mrs. Lount and petitions signed by a reported 30,000 people asking for mercy. As the former governor of the Tasmanian penal colony and a man who'd signed over 1000 execution orders, he had a heart of stone. Aside. The lieutenant-governor who served during the rebellion, and who caused many of the problems, had returned to England. He fled in disguise and ran smack into a mob of rebel refugees in New York State. 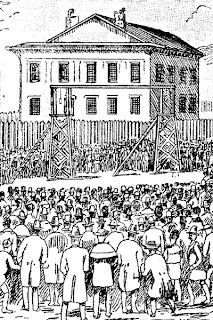 Lount and Matthews died by hanging in Toronto, April 12, 1838, before a large crowd. Lount's last words were: "Be of good courage boys, I am not ashamed of anything I've done, I trust in God, and I'm going to die like a man." These words appear on a historical plaque at King and Toronto Streets, near the site of the old Toronto jail. Spectators witnessed more barbarity than they bargained for that day. An overly long drop in the gallows nearly severed Lount's head from his body. His blood spewed widely and puddled the ground. One Rochester paper reported that "two ruffians seized the end of the rope and dragged the mangled corpse [of Lount] along the ground into the jail yard, someone exclaiming 'this is the way every damned rebel deserves to be used'." Aside: A 1985 eponymous movie dramatized Samuel Lount's life. Lount and Matthews were the first rebel leaders to die by hanging, but far from the last. At their execution, Lount had seven children and Matthews fifteen from two wives. Van Egmond (March 10, 1775-January 5, 1838) originally from the Netherlands, became ill in prison and died in hospital four weeks after the attack on Toronto, probably from pneumonia. 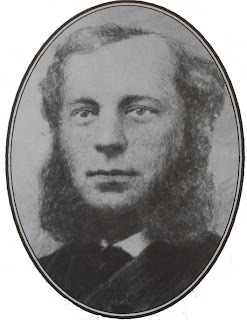 Their jailors refused to give the bodies of Samuel Lount and Peter Matthews to their families and buried them in Toronto's Potter's Field near the present-day intersection of Bloor and Yonge streets. They remained there 21 years. On November 28, 1859, William L. Mackenzie removed their bodies and re-buried them in the Toronto Necropolis. He was accompanied by Samuel's brother George, Samuel's son Charles, and his nephew William. See the Dictionary of Canadian Biography Online for more on the life of Samuel Lount and Anthony Van Egmond. For historic info on Peter Matthews, visit a web site belonging to one of Matthews' great grandchildren.